Radio waves act similar to light waves. With a mirror, light waves can be made to change directions. Also, with each reflection, the image is reversed as seen by the eye. Radio waves (or signals), can be redirected with reflecting boards (see example), passive repeater antennas or live repeaters. Each solution to Non-line of Sight situations requires engineering to assure that the waves reach the destination antenna with enough signal strength and without too much out-of-phase reflection. Reflections caused by adjacent obstacles can send signals to the receiving antenna that are out of phase or partially reversed like mirrors reflecting an image from different angles. Below are real examples of these 2 NLOS (Non-line of Sight) solutions. 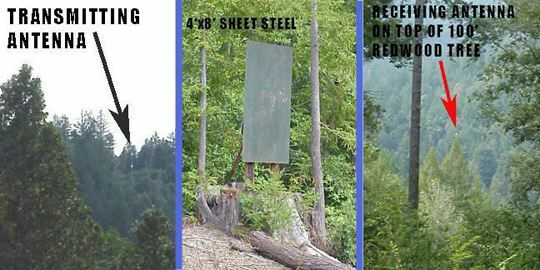 Non-line of Sight solutions: Reflecting board. Passive reflecting board redirecting a 5.8Ghz signal in middle of a 3 mile path with extremely good results. 3′ parabolic antennas are directing a 200mw signal in a 6˚ beamwidth. We have also redirected a 2.4 Ghz signal with satifactory results in Ettersburg using a precision flat 7′ x 8′ aluminum board reflecting a signal from a 120˚ sector antenna. These solutions will have to be engineered on an ICB (individual case basis) and you can figure on a minimum of $2000. You are always welcome to come up with your own solution. A radio is placed in a location, often a neighbor’s house, that has line of sight to our access point and another radio is placed within 300′ of the 1st radio in a location that the end residence/business has line of sight with. It is very common for a residence/business to be in a valley with line of sight to a ridge/neighbor that has line of sight to one of our access points. The radio equipment install/cost for this setup is around $750. The relay location can be used to serve multiple locations. This is the cheapest way to re-direct a radio signal if you have power at the repeater site. Solar power works great for areas without electricity, but is an additional cost, approximately $1000. The radios we use consume 5 to 7 watts each at 24VDC. 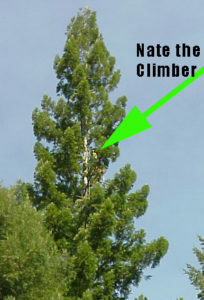 We often have a tree climber install an antenna high up a tree for better reception.